The Human Capital Life Cycle illustrates the level of support employees give during the various stages of a project: analysis, design, construction and implementation. At certain stage(s) within a project, people will go through what is called the "Valley of Tears." Typically, when people are entering the Valley of Tears they become less motivated, project deadlines can slip, rework occurs and absenteeism increases. 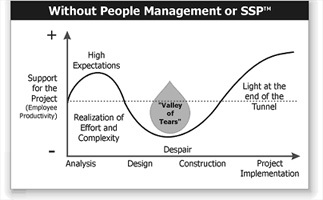 LMR's Success People Process™ (SPP) methodology begins by understanding the nature of the "Valley of Tears" and its relationship to the specifics of a job, a project or a task at hand. By identifying the unique characteristics of each project and the characteristics of people available to perform the tasks, a "best fit" for each task is coordinated. A "best fit" occurs when a task can be performed by a person with the greatest of ease and with the highest possible quality of delivery. When a sense of ease is developed, the degree and length of time in the "Valley of Tears" is lessened. Project time and project cost decreases. 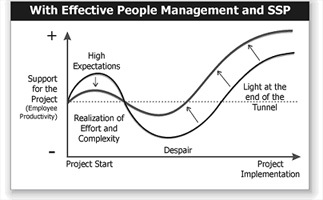 See Figure 2 below - Effective People Management with SPP. Example: A company is installing an enterprise-wide Customer Relationship Management System (CRM). A CRM Successful People Process™ is tailored to identify strategic CRM tasks. People best suited for the completion of strategic tasks are assigned, thereby lessening the depth into the "Valley of Tears". Another LMR methodology, called the SP3M Service Model™, (3M means Measure, Market and Manage), is used to measure, market, and manage valuable CRM data across the entire organization - for the lifetime of the CRM product. This straightforward process maximizes the CRM software usage and enhances the ROI* of any complex hardware, software or service implementation. Successful People Process™ is designed with a Level 5 measurement in mind. LMR Associates knows that to maximize the ROI* of company initiatives or training sessions, specific action-based results need to be produced as an outcome. We document results in an ROI case study for your use with internal or external customers. Level 1- Smile sheet- Did employees like the training? Level 2- Did employees learn something? Level 3- Did employees apply training on the job? Level 4- Did that change in job performance affect the bottom-line positively? Level 5- Measure ROI*- Compare costs of training/projects to an increase in sales and customer loyalty, less rework. LMR Associates works with your organization to develop people using proven processes that produce measurable results. * ROI is the comparison of the cost of the training/initiative vs. the increase in productivity, sales, customer loyalty, etc.